A time-traveller attempts to avert an apocalyptic event. A labyrinthine time-travel thriller which places the fate of the planet in the hands of the mentally abnormal, Terry Gilliam’s hypnotic Twelve Monkeys may yet become recognised as a masterpiece of genre storytelling. 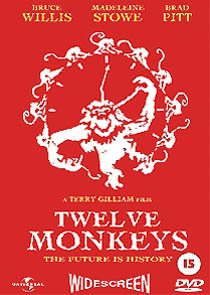 Universal have released the film on DVD in the UK paired with the excellent behind the scenes documentary The Hamster Factor and Other Tales of Twelve Monkeys. The transfer is a little better than the notoriously nasty Region 1 version, but isn’t 16:9 enhanced like the US disc. The US version also features a number of supplements including a very entertaining Gilliam commentary track, that haven’t been carried over onto the UK disc. The film has an elaborate 5.1 sound mix, and is letterboxed at 1.85:1. There have been rumours that Universal will release an Ultimate Edition version in the US (let's not forget that the film grossed more than $150m, more than five times its budget), but until then, the best version may be the Region 4 release, which is anamorphic, and has the commentary track. There's a Region 1 DTS variant, without any bonus material, but the concensus seems to be that there's very little difference between the DTS track and the 5.1 Dolby Digital mix, and much to lose (the Hamster Family documentary is superb).